This leg of the journey is now almost routine. Early morning taxi awaits at 06.00. 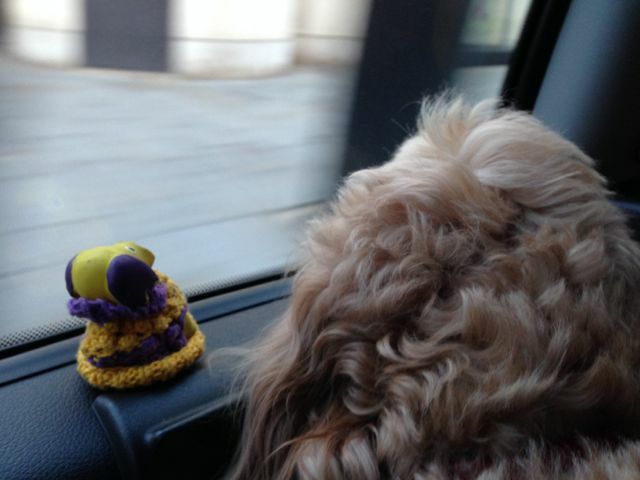 Here’s me travelling with Little Yellow Dog in the taxi – he’s so excited! 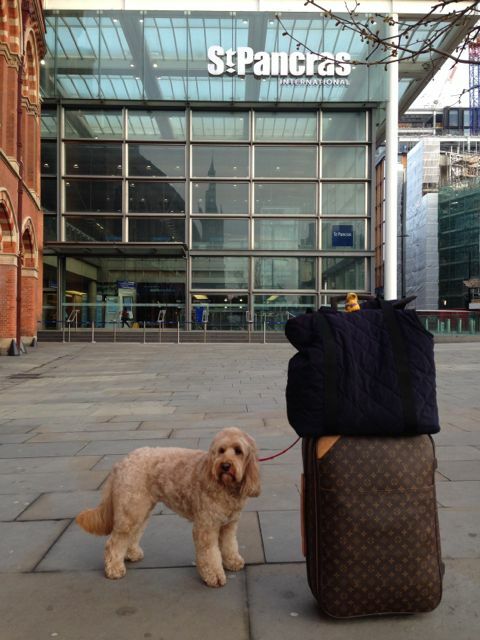 We know it’s the platforms at the far end of St. Pancras International – and Mummy knows I don’t like the escalators so she carries me. But today she had a roller bag and my bag, etc. So this nice older gentleman stopped to help but he’s not used to roller bags so as he pulled the rather heavy roller bag, he fell forwards! OMG! Mummy thought he was going to push her down with me in her arms. So there she was holding me and holding the man and they were both stopping the bags from rolling down the escalator!!! It was quite hilarious – after the fact but for a moment. Think the man was quite embarrassed. Snigger! Snigger! We board our train to Folkestone and at 07.10 the train departs. A little less than an hour we arrive at Folkestone West. A driver from Folkestone Taxi awaits us at the smaller station. This time we had Stewart Weller and guess what? 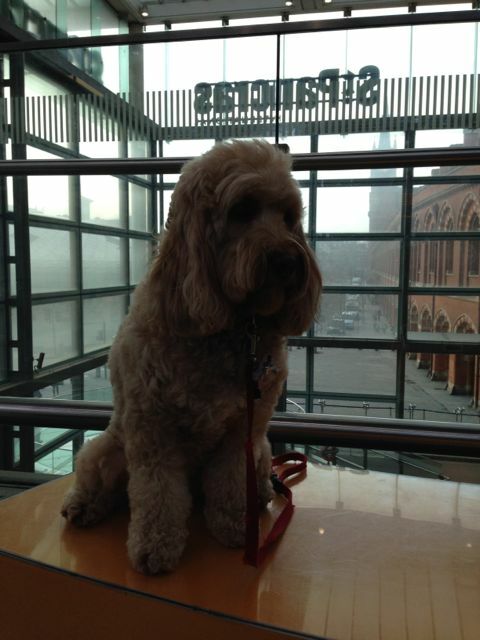 He was at Crufts with his golden retrievers and his dog performed with the Southern Golden Retrievers act! Wow! How cool was that!?!?!? 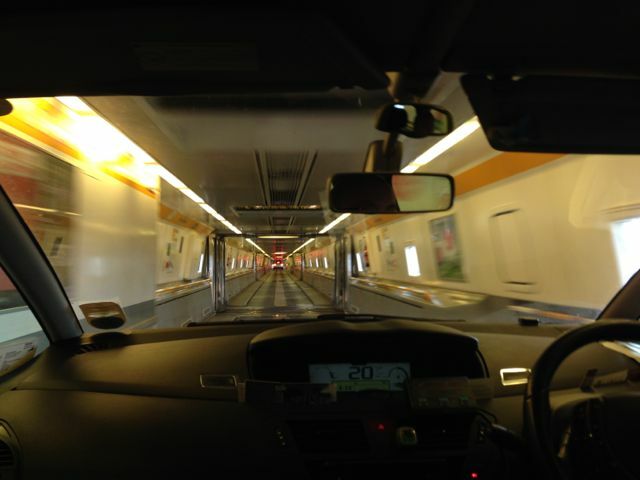 We were soon at Eurotunnel crossing – waiting for our turn to board the train. Our crossing is at 08.50. 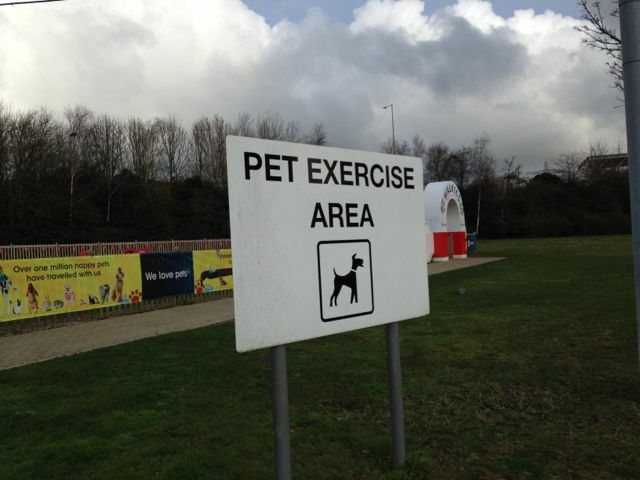 Before that I had a little thing I need to do at the Pet Exercise area. 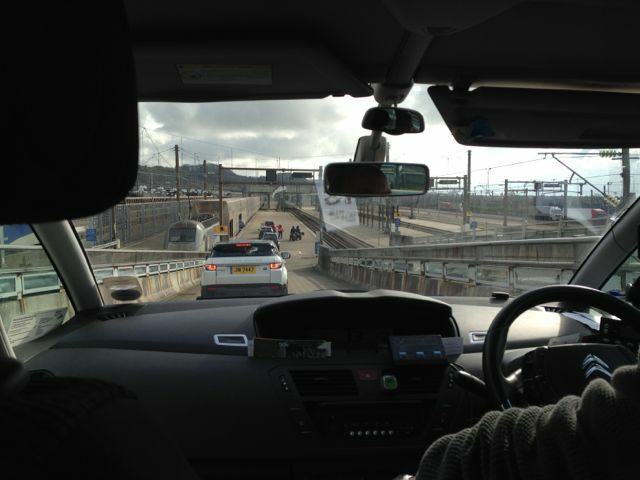 and we emerge the other end – thirty-five minutes later we’re in Calais. It’s an hour ahead so by now it’s 10.25. We drive to Calais Ville train station and get on board the 11.06 SNCF train to Lille Flandres, arriving almost an hour and a half later, we change trains for Paris. 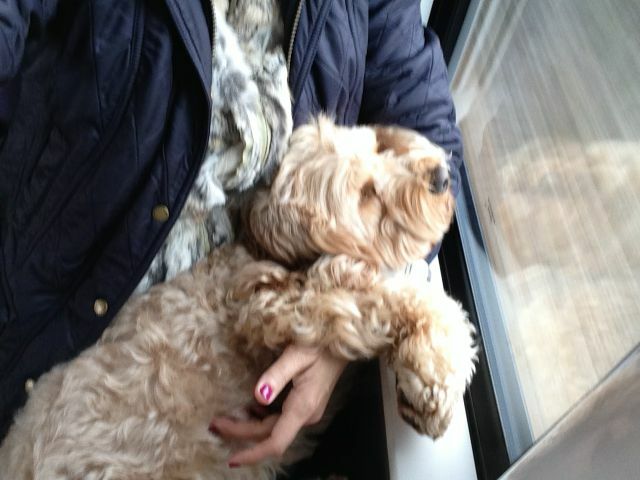 While I travel for free in UK trains, Mummy has to buy a half price Second Class child ticket for all French trains. Finally we arrive at Gare du Nord in Paris at 14.18. This is the difficult part. We stand in line to get a taxi and as we get to the front of the queue, Mummy has to put me in my carrier bag because a lot of the Parisian taxis do not like to take dogs. 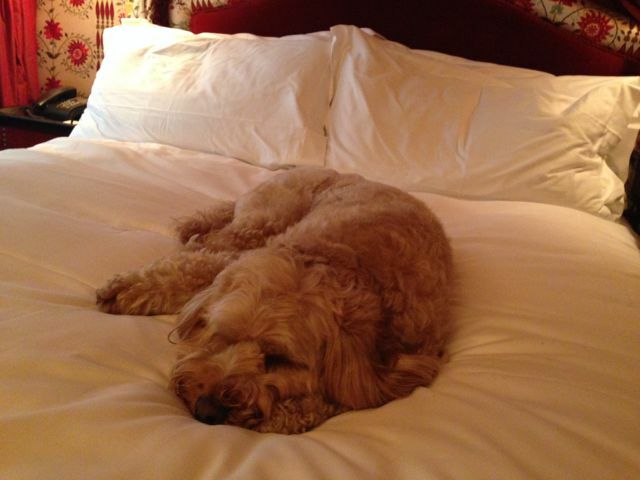 Who ever said the French like dogs?!?!?! So when I am in a bag, there are greater chances that we will find one that will take us. Poor Mummy’s shoulders. I am not so light. The second taxi took us but he did not let us know that it would cost an extra 5 Euros to take me until we got there. 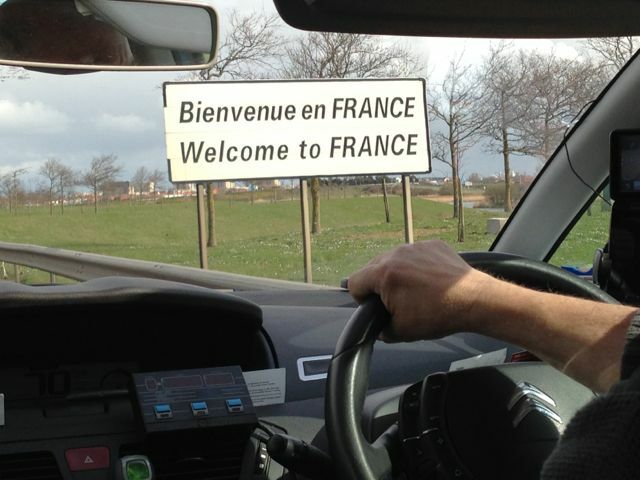 These French taxi drivers are not very nice. We arrived at the hotel, happy to finally put the bags away – and a little rest, for one night till we begin our travel again tomorrow. May’s comment: Knackered! Early morning rise, eight sectors of travel before we got to the hotel to rest our bodies for just a little while. After all we are in Paris for just one day. The last time we went to the Eiffel Tower. This time, I showed Darcy some of the old hangouts I used to love. 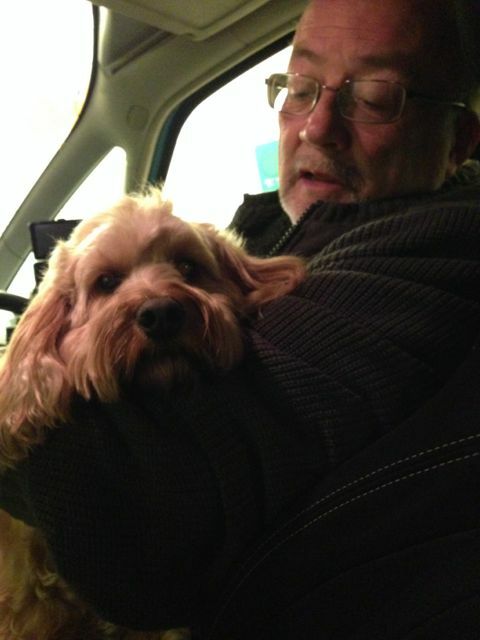 And now, I share these memories with Darcy. I’m exhausted too just reading it whilst on my sofa !